I can't believe I've already read my first book for the Back to the Classics Challenge and that it is one that has been languishing on my TBR for a few years at least. What a satisfying feeling! For "A Classic in Translation", I chose The Ladies' Paradise by Émile Zola, published in France in 1883 as Au Bonheur des Dames. 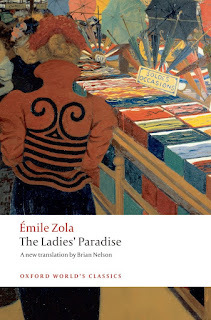 It is the eleventh book of Zola's Rougon-Macquart series but is able to be read as a stand-alone. The book before it features one of the main characters but at a different phase in his life. As this was a purchase based on watching the television show The Paradise, I wasn't aware of the full series until later. Basically, the main character in the story *is* the Ladies' Paradise, one of the first department stores -- based on the real Le Bon Marche but created as a rival store. Many of the pages of the story are dedicated to describing both the building and the eye-catching displays of household products and clothing. Its owner, Octave Mouret, is a widower and is the mastermind behind the undertaking. Denise Baudu is a newly-orphaned 20 year old who has two younger brothers to support. When the older one, Jean, gets an apprentice job in Paris, Denise moves the family and finds herself at her uncle's shop, across the street from the amazing Paradise. She quickly gets herself a job there and we follow Denise, Mouret, and many other characters through their interactions with each other and with the store. This particular translation was clear and easy to read. There was just one sentence that stood out to me and made me question if Brian Nelson added anything else to the text. It was "[t]his was the embryo of the vast trade unions of the twentieth century." As the book was published 17 years before the twentieth century and Zola died only two years into the century, he would have had to have been Nostradamus to have written this sentence. 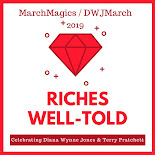 As for the story, I didn't fall in love with any of the characters, especially since quite a few of them were rather flawed, sometimes even loathsome. They, however, had no problems falling in love with each other, creating quite a messy (in a mostly good way) story. Regardless, I enjoyed the journey beside them and the explorations into Parisian culture and commerce. I truly felt disappointed that the heyday of the department store was before my time. Even just as a historical artifact, this novel preserved something special. I've heard mixed reviews from people on this one but that might just be whether or not one likes Zola generally. I hope to get to it one day and I'm glad to see Brian Nelson has a translation out for it now. My favorite Zola translator has passed away so I look out for Nelson's work when I can. I'm glad to know that you normally like this translator. That means the one line was probably just a fluke addition. I agree that the main character of the novel was The Ladie’s Paradise and the other characters who were, like, actual characters and not department stores were totally underdeveloped. Denise was the worst, she was dumber than a door nail. But the picture Zola painted of the first giant retailers was pretty epic, so I had fun reading it for that. But I sure wanted to go shopping when I was done with the book so that part was great. I thought it had a lot of modern interest as it relates to commerce -- the rise of Amazon and the fall of, well, everything else is nicely mirrored. I hope you get to it! This is on my classics challenge list too and so eager to read it--I've been wanting to for awhile, and since I am going to France in July/Aug, I'm reading up on Paris in particular. My version is by a different translator than yours--I wonder if he will be as much of a seer! I loved your comment about Nostradamus. I think there is something fascinating about the advent of the dept store--even now, I love visiting the big ones in major cities like NYC.